Cold, clear water in the state of New Hampshire makes the perfect home for big trout and salmon. Many NH lakes also offer excellent fishing for smallmouth bass, largemouth bass, white catfish, black crappie, white crappie, walleye, rainbow trout, brook trout, brown trout, lake trout, bluegill, pumpkinseed sunfish, rock bass, white perch, yellow perch, Atlantic salmon, coho salmon, stripers, bowfin, chain pickerel, northern pike and tiger muskie. Visit local lakes, rivers, ponds and streams to wet a line. This chart shows the major fishing waters in New Hampshire, cross referencing these waters with the major types of fishing to be found in each of the lakes or impoundments. For a more complete list of fish species in New Hampshire, see the list below, which also includes state records. Bow Lake is a 1,200-acre lake in the southeast part of the state, at Cornway, NH. Comerford Lake is an 1,100-acre lake on the western border of the state, at Monroe, NH. Conway Lake is a 1,300-acre lake in the northeast part of the state, 4 miles north of Northwood, NH. First Connecticut Lake is a 2,800-acre lake in the northern tip of the state, 6 miles northeast of Pittsburg, NH. Great East Lake is an 1,800-acre lake on the eastern border of the state, at Wakefield, NH. Lake Francis is a 2,100-acre lake in the northern tip of the state, at Pittsburg, NH. Lake Sunapee is a 4,100-acre lake in the central part of the state, at Sunapee, NH. Lake Wentworth is a 3,000-acre lake in the northeast part of the state, at Wolfeboro, NH. Lake Winnipesaukee is a 44,000-acre lake in the east-central part of the state, at Wolfeboro, NH. 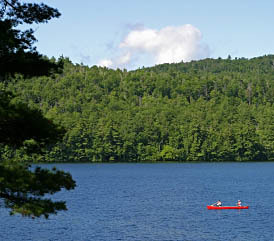 Mascoma Lake is a 1,100-acre lake in the west-central part of the state, at Enfield, NH. Massabesic Lake is a 2,900-acre lake in the southeast part of the state, at Auburn, NH. Merrymeeting Lake is an 1,100-acre lake in the east-central part of the state, 2 miles north of New Durham, NH. Moore Reservoir is a 3,500-acre lake on the western border of the state, 2 miles west of Littleton, NH. Newfound Lake is a 4,100-acre lake in the central part of the state, at Bridgewater, NH. Ossipee Lake is a 3,100-acre lake in the northeast part of the state, at Center Ossipee, NH. Paugus Bay is a 1,200-acre lake in the central part of the state, at Laconia, NH. Second Connecticut Lake is a 1,300-acre lake in the northern tip of the state, 10 miles northeast of Pittsburg, NH. Silver Lake is a 1,000-acre lake in the northeast part of the state, at Silver Lake, NH. Squam Lake is a 6,700-acre lake in the north-central part of the state, at Holderness, NH. Umbagog Lake is a 7,600-acre lake in the northeast part of the state, 5 miles east of Errol, NH. Winnisquam Lake is a 4,300-acre lake in the east-central part of the state, at Laconia, NH. Click here for a New Hampshire fishing license. For additional information on fishing in New Hampshire, visit the New Hampshire Fish and Game Department website. Visit AA-Boats-Boating.com to find information about fishing boats in New Hampshire and other boating information. Excellent largemouth bass and smallmouth bass fishing opportunities are available to anglers, here in NH.